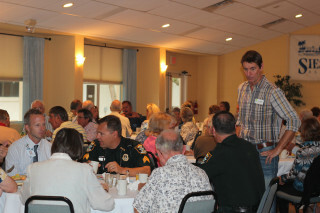 As he had two days earlier before the Siesta Key Village Association (SKVA), Sarasota County stormwater engineer Ben Quartermaine presented details about an upcoming drainage project to about 25 members of the Siesta Key Association (SKA) on Dec. 3. This time, however, one of the residents in the affected area, Paul Chadwell, challenged Quartermaine on one assertion and complained that county staff had not given adequate attention to the problem until after Chadwell himself called a local TV station when heavy rainfall in September 2013 produced flooding in Chadwell’s yard up to his thighs. As he had explained to the SKVA members on Dec. 1, Quartermaine pointed out that the drainage project has been planned to alleviate problems created by the inability of stormwater to drain into the Gulf of Mexico from an area close to the Ocean Boulevard/Higel Avenue intersection, including the south side of Ocean that drivers see as they head to and from Siesta Village. 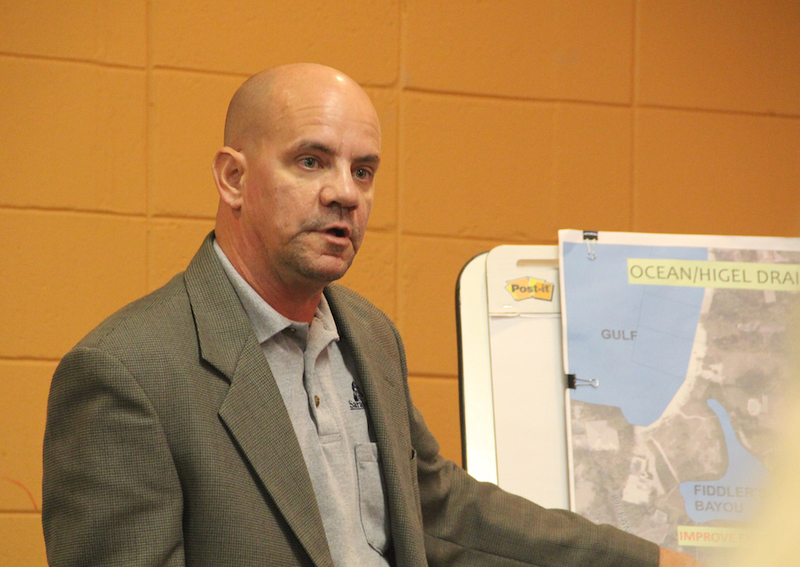 The accretion of sand and dunes on the north end of the island, Quartermaine said, keep stormwater from flowing out of Lake Banan — west of Higel and south of Ocean — and Fiddler’s Bayou — north of Ocean, which was the normal pattern in the past. Therefore, Quartermaine continued, county staff has applied to the Southwest Florida Water Management District (SWFWMD) to obtain a permit that would allow excessive stormwater to drain into the Grand Canal on the east side of Higel. The plan calls for laying pipes in the ditches between Reid Street and Ocean Boulevard on the west side Higel and on the south side of Ocean. The drainage system also would be enlarged along Lotus Lane, he added, which is east of Higel, adjacent to the Grand Canal. The pipes will be covered by bioswales, he continued, which will have landscaping — plants that grow well in sandy soil. Further, Quartermaine noted, the pipes will contain boxes to catch sediment that will filter out of the water, and they will have baskets to catch floatable garbage, which then will be retrieved by county equipment. In September 2013, he told the SKA members, “We were close to having Ocean [Boulevard] go underwater,” because rainfall was so heavy that month. “No,” Quartermaine replied. The design of the project has to be completed, and the County Commission has to approve a construction contract, Quartermaine added. 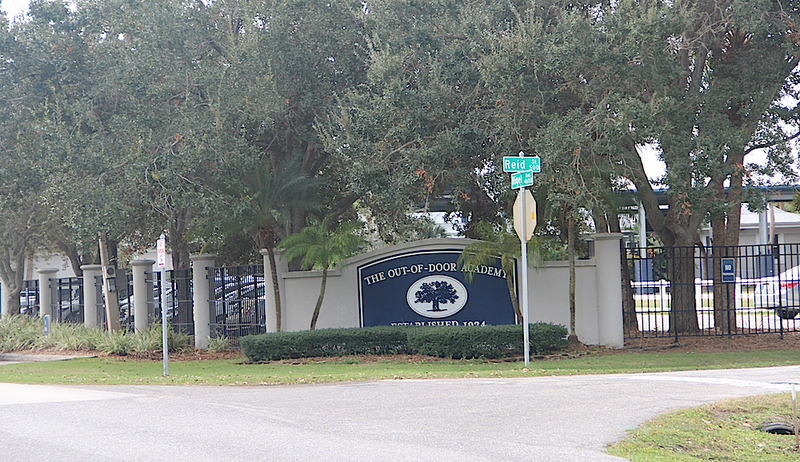 The Out-of-Door Academy (ODA) is located at the intersection of Higel and Reid. He was referring to people with children in school at The Out-of-Door Academy. When Quartermaine then pointed out that Lake Banan has a pipe that drains to Ocean Boulevard, Chadwell interjected that water from that pipe flows toward Siesta Village. “It’s a 12-inch pipe; it drains into Ocean,” Quartermaine responded. County employees who recently visited the site did not know where the water went, Chadwell stressed, so he tried to show them where the outfall is. “We have surveyed it now,” Quartermaine responded, referring to that pipe. The real benefit of the lake, he noted, is that it can store excessive stormwater. 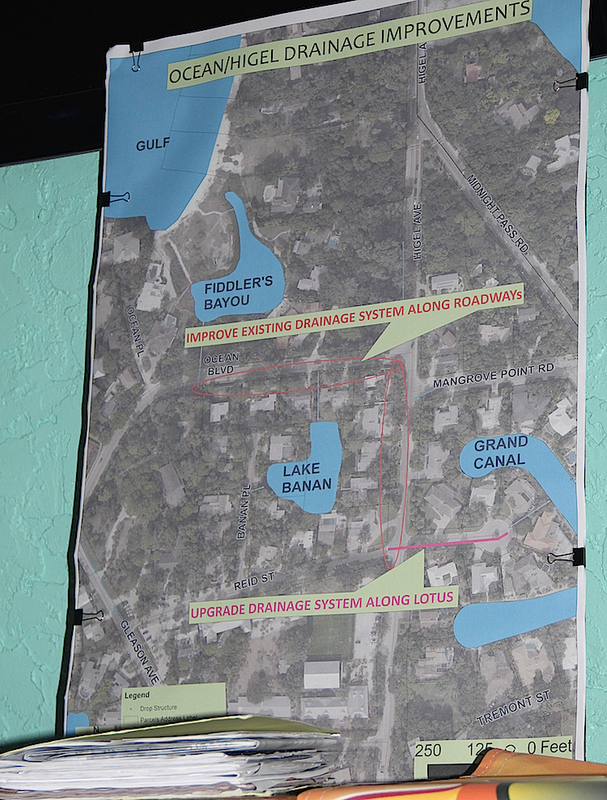 Quartermaine reiterated his earlier remark that the plan calls for the elevation of pipes to the Grand Canal to be lower than the level of Lake Banan. The runoff into the lake is coming from ODA and Siesta Key Chapel [close to the school], “because they keep building” at ODA, Chadwell pointed out. With less open land into which stormwater can drain, Chadwell noted, the water goes right to his street. “You’ve described it better than I did,” Quartermaine told him. Shay suggested Chadwell get Quartermaine’s business card so the two could talk later. Then SKA board member Deet Jonker asked how the stormwater flowing into the Grand Canal will affect the level of that body of water. “We’re going to bring it there a little faster, but the volume is not changing,” Quartermaine said of the stormwater. Quartermaine added, “I certainly can spend time in the field with you” to discuss any other concerns about the flooding and the project. 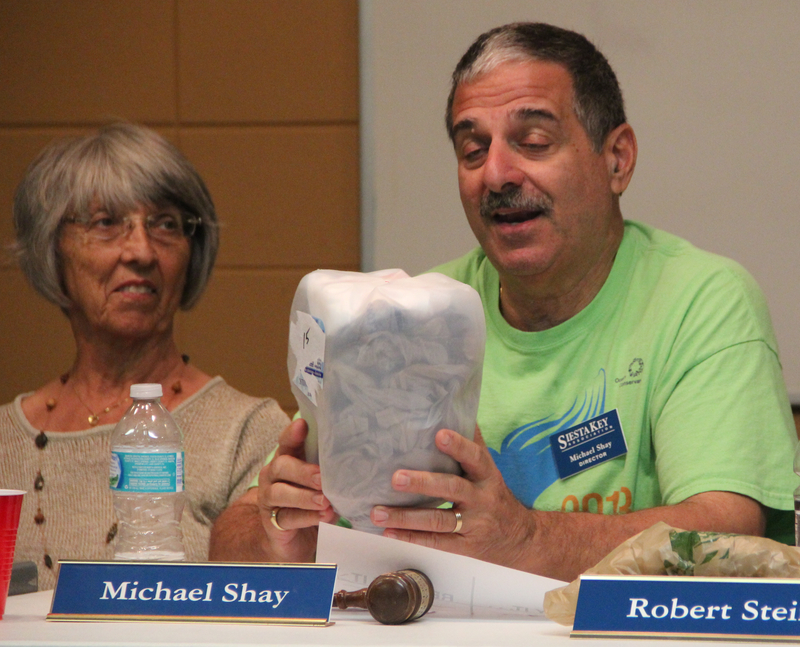 SKA President Michael Shay announced during the Dec. 3 meeting that the organization has received permission from the Sarasota County Parks, Recreation and Natural Resources Department to undertake a trial trash collection program at Beach Access 7. “We have to work closely with them on anything we design,” he explained of county staff members. The pilot program proposal grew out of SKA meeting discussions regarding regular beachgoers who already collect trash on the beach. The plan is to erect some type of dispenser at Beach Access 7 so people can take bags from it to use as they pick up debris on the beach, he continued. 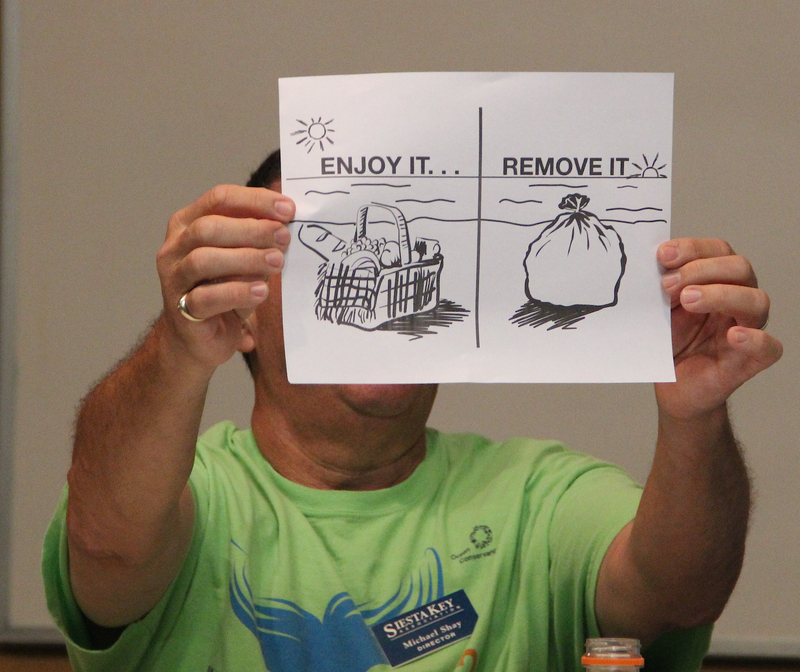 Board member Joe Volpe has a friend with a design background who came up with a potential poster to accompany the dispenser, Shay added, holding up a sheet with two drawings. One side says, “Enjoy it …” and shows a picnic hamper brimming with food. The second side has the heading, “Remove it,” under which sits the image of a neatly tied garbage bag. “We have not run this past the county yet for their approval,” Shay told the audience. Because Publix grocery stores have containers where people can return plastic bags, Shay said, “we can get a ready supply” of bags from Publix. During the Dec. 3 SKA meeting, Secretary Joyce Kouba introduced a new board member: Dan Lundy. A New Jersey native, he has been a full-time Siesta resident for the past three years, she added. In yet another announcement during the Dec. 3 SKA meeting, President Michael Shay said the organization’s annual breakfast gathering will be held on Saturday, March 5, at St. Boniface Episcopal Church. Sarasota County Commission Chair Al Maio will be the keynote speaker, Shay added. In the meantime, the organization’s membership drive is under way. Deet Jonker, who heads up that effort, urged members and newcomers to the SKA to pay their 2016 dues through the SKA website. “You will find that you can join online very easily,” he said. In early 2016, he continued, the organization will send a mailing to all households on the island without a member, with the hope more people will be interested in joining the SKA. The online payment or renewal of dues “saves us a lot of money in mailing costs,” board member Joe Volpe pointed out. “And it saves our treasurer a lot of angst in having to handle checks,” Shay noted, adding that he is the primary person taking care of the organization’s funds right now.